Düsseldorfer Toastmasters was founded in 2005. Since then, the number of its members has continuously increased, so much so that we are now one of the biggest clubs in Europe! We interpret this as proof both for the high level as well as the enjoyment in learning that we regularly offer in our club. Since 2015 we have been listed as a “Registered Association” which supports the promotion of knowledge and intercultural exchange. The Düsseldorfer Toastmasters come from very diverse occupations: parts of our members have not been raised in Germany and speak a different mother tongue. We are roughly the same number of women as men. Our members are between 18 and 70 years old. The Düsseldorfer Toastmasters are open for you if you enjoy improving your speaking skills or supporting others in doing so. 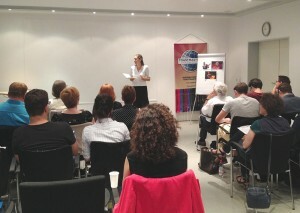 Would you like to know more about the concept behind Toastmasters?